As a water systems professional, you probably assemble large motors and pumps in the field on a regular basis. However, there are also occasions when you may need to assemble smaller 4-Inch pumps to motors, either in the field or back in the shop. For example, the assembled unit you took to the job site may not turn out to be the one you actually need. You might have planned on installing a 115 V unit, but you discover at the job site that you actually need a 230 V motor instead. If you have that 230 V motor on the truck, you can simply switch motors. In other cases, you may not have the right GPM pump rating and motor combination, and you have to “mix and match”. Finally, for a variety of reasons, some contractors simply prefer to purchase their pumps and motors separately, and perform the assembly themselves. 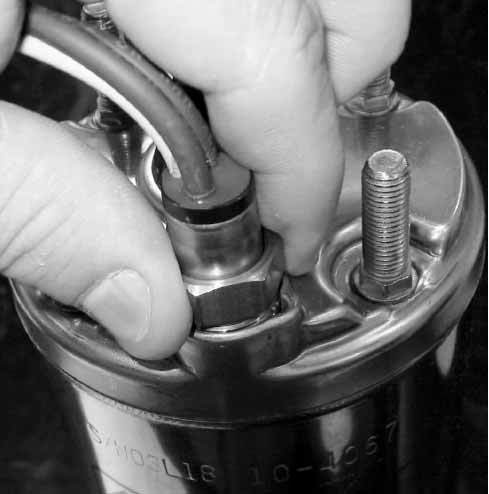 In this issue of Franklin AID, we’ll review the proper procedure for assembling a 4-Inch pump and motor in the field. The steps are straightforward, but merit a quick review. So, here are the steps. First, verify that the motor and pump horsepower ratings match. That is, a 1 horsepower pump is going on a 1 horsepower motor. While you’re at it, make sure the electrical rating of the motor matches the electrical power at your installation. For example, if it’s a 115 V installation, make sure the motor is indeed nameplated 115 volts. Also, make sure you have the right motor in terms of single-phase versus 3-phase. A few seconds could save you a lot of time (and maybe some embarrassment) down the road. Note that there is one important exception to the above. If you are installing a SubDrive unit, the motor and pump rating will normally not be the same. For example, the SubDrive 75 uses a ¾ horsepower pump assembled to a 1½ horsepower 3-phase motor. Power to the SubDrive Controller will still be single-phase. See the SubDrive installation manual for details. Inspect the motor and pump packaging, the pump and motor exterior, and the motor lead for any handling damage. The outer shell of both the pump and motor should be free of any dents or other obvious damage. 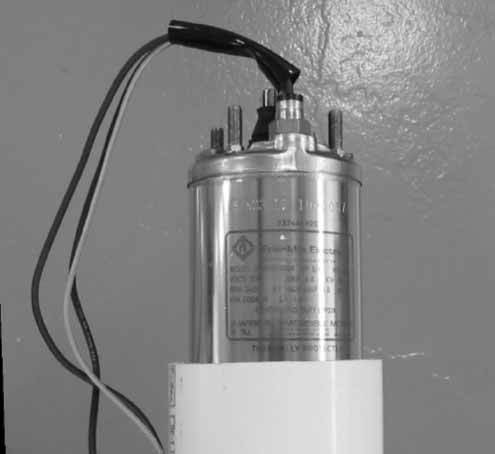 Most Franklin Electric motors manufactured in North America come with the lead installed and the lead is considered part of the motor. Never reuse an old lead because the rubber bushing may have taken a “set” to that particular motor over time. By the way, all Franklin Electric motors are pressure-tested with the lead installed before they leave the factory. If you do need to replace the lead, use the orientation key and “finger start” the stainless steel jam nut a few turns to make sure it engages. Then, tighten the jam nut using a ¾ inch end wench. It should be snug, but do not over tighten. Recommended torque range is 15 – 20 foot-pounds. If the pump coupling has not been pre-greased by the pump manufacturer, Franklin Electric recommends using a FDA-approved waterproof grease for maximum protection against spline wear. A couple of examples include Mobil FM102 and Texaco CYGNUS2261. 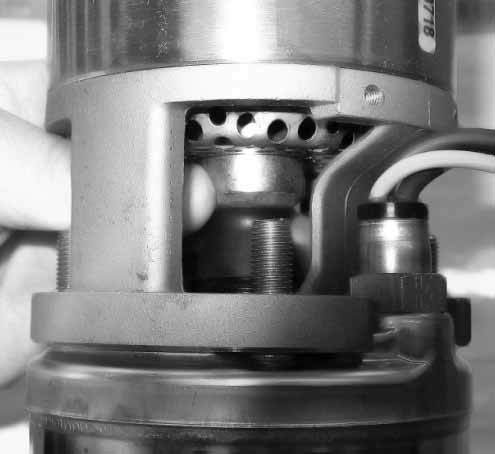 Apply a small amount to the top end of the motor shaft and apply some inside the pump coupling. If attached, remove the cable guard from the pump. If there’s an external, removable pump intake screen, remove that as well. In some cases, the pump manufacturer may supply their own sand slinger. If so, replace the Franklin sand slinger that came with the motor with the one supplied by the pump manufacturer. Do not use both. Now, you actually ready to assembly the pump to the motor. 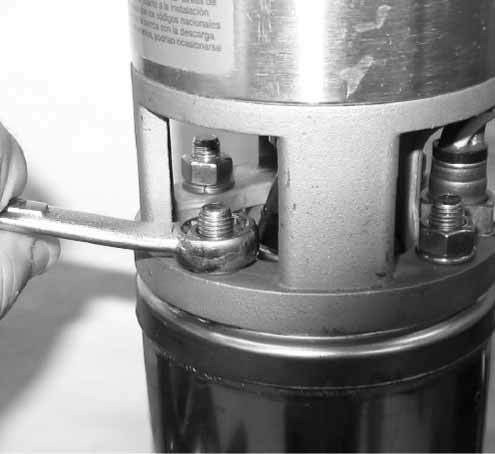 Stand the motor with the shaft up on a flat service and carefully set the pump on the motor. Some contractors even have a fixture like the one pictured below in which to place the motor. This prevents any chance the motor could fall over. 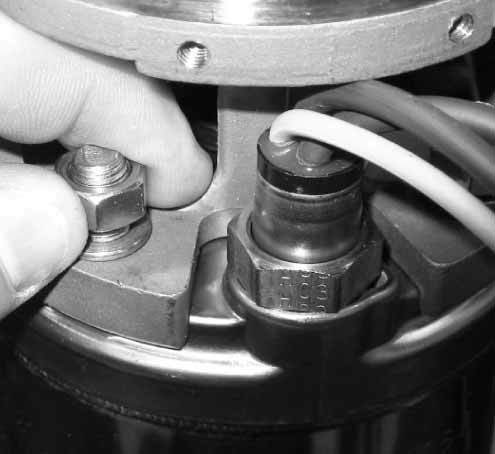 Make sure the pump fully seats on the motor face, with no gaps between the motor mounting face and the pump flange. If the motor splines don’t immediately engage in the pump coupling, you may need to turn the pump or motor shaft slightly until the splines engage. Hand-tighten the nut fasteners provided by the pump manufacturer that hold the pump to the motor. Then, starting with one of the studs opposite the motor lead, tighten it until it is snug. Once again, do not overtighten. Continue tightening the 4 nuts evenly, in a diagonal pattern, just like lug nuts on a car or truck wheel. The recommended torque range is 10 – 14 foot-pounds. 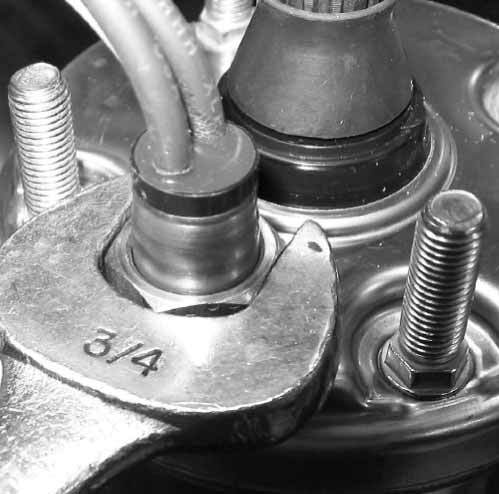 Make sure that the pump remains seated squarely on the motor while you tighten the nuts. It’s now time to install the cable guard. It may be easiest to do this with the motor placed on a flat, horizontal surface. Install with the fasteners provided by the pump manufacturer, making sure the motor leads don’t get pinched in the process. Also, position the black protective lead sleeve at the bottom or top of the pump in accordance with the pump manufacturer’s recommendations. Finally, if required, install the pump intake screen. There you have it. You have now professionally assembled a 4-inch pump and motor. Follow the pump manufacturers recommendations concerning installation into the well, as well as the guidelines in Franklin Electric’s Application, Installation and Maintenance (AIM) manual. Of course, if you have questions, call Franklin Electric’s Technical Service Hotline at 800-348-2420. This entry was posted in Archives and tagged 4-inch, Motors, Pumps by copywriterfele. Bookmark the permalink.